Craft brewers and restaurants could be natural allies, united in dispensing good cheer to the masses. Not this time. The local beer biz is buzzing right now over a bill filed on behalf of the restaurant industry to crack down on beer gardens. These open-air festivities blossomed around Boston last year, opening the taps on a new market for enterprising local brewers. They were a big hit. Trouble is, restaurateurs were left out of the party. Now, the restaurant industry is fighting back, taking aim at the one-day licenses that brewers use to hoist their tents. State Senators Ed Kennedy of Lowell and Nick Collins of South Boston have cosponsored a bill that would bar any individual or company from getting more than 14 one-day licenses in a given year. Sure sounds like a buzzkill. There’s a twist: Existing state law prevents applicants from obtaining more than 30 of these one-day licenses; brewers can get around this by having more than one applicant pick up licenses on their behalf. Restaurateurs are less than pleased with the proliferation of beer gardens. But these outdoor drinking spots are nothing to fear, though it’s appropriate to refine regulations governing them. As Bob Luz, the Massachusetts Restaurant Association’s chief executive, puts it: Just because it’s cool doesn’t mean it’s legal. And with Boston in the lead, Luz says it’s only a matter of time before the popularity of beer gardens catches on in other cities. Luz says the current state law is being misused, to the detriment of nearby restaurants. He says Boston beer gardens are draining drinkers from brick-and-mortar establishments — without the attendant costs, oversight, or bathrooms with actual plumbing. Obtaining a year-round liquor license can be a big deal in the city. An expensive, time-consuming process. Kennedy says he’s just trying to level the playing field. He says one-day licenses were originally intended for special events, such as fund-raisers or weddings, not recurring, for-profit fixtures. What kicked off this brouhaha? Trillium’s success on the Greenway in 2017 prompted many other brewers to join the fun last year. 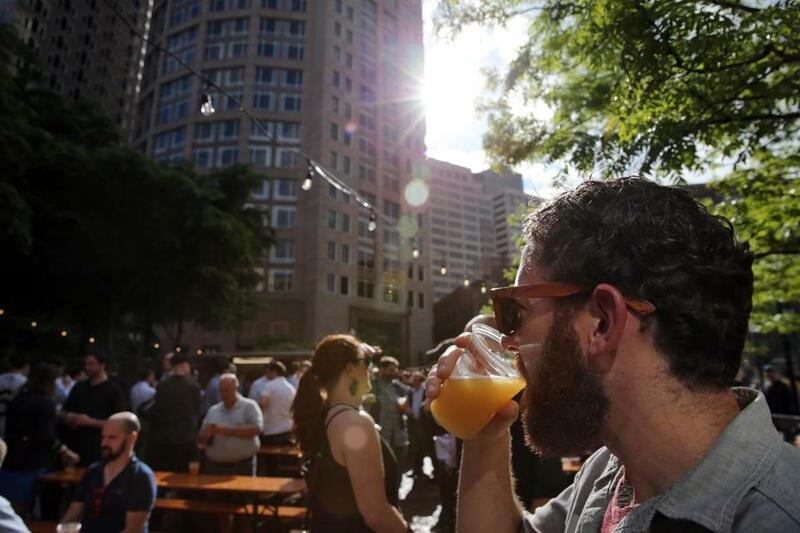 Figures provided by City Hall show that the number of one-day licenses issued in Boston specifically for beer gardens doubled in 2018, rising to 82 last year from 39 in the previous year. Publicly, at least, the craft industry doesn’t sound like one that is brewing for a fight. Trillium co-owner Esther Tetreault says she wants to work with lawmakers “to create a better solution” that benefits consumers and nearby residents. And the Massachusetts Brewers Guild issued a polite statement: Its members “look forward to working closely with our legislature . . . to resolve any inefficiencies” in the system. But there’s some grumbling, too. These projects can be big investments. Castle Island Brewing founder Adam Romanow estimates the setup and rental costs could exceed $100,000 for the typical Boston beer garden. Castle Island created 15 to 20 seasonal jobs for its garden that ran four days a week over three months in Charlestown last year, and additional jobs back at the Norwood brewery to keep up with demand. Those economic benefits, he says, could be jeopardized by a 14-day cap. Notch Brewing founder Chris Lohring worries about the bill’s implications for his Salem company’s “Traveling Biergarten” held in various parks and farms; he also wonders about the consequences for nonprofits that rely on these licenses. The legislation, after all, doesn’t just deal with craft brewers. Kennedy admits the bill — essentially just one long sentence — could use some refinement. He also doesn’t want to see nonprofits, such as a theater group in his district, take a hit. Maybe the bill can help ferment a broader debate about updating the state’s antiquated liquor license laws. Who knows? That might lead to legislation that actually prompts brewers and restaurateurs to raise a glass together again.